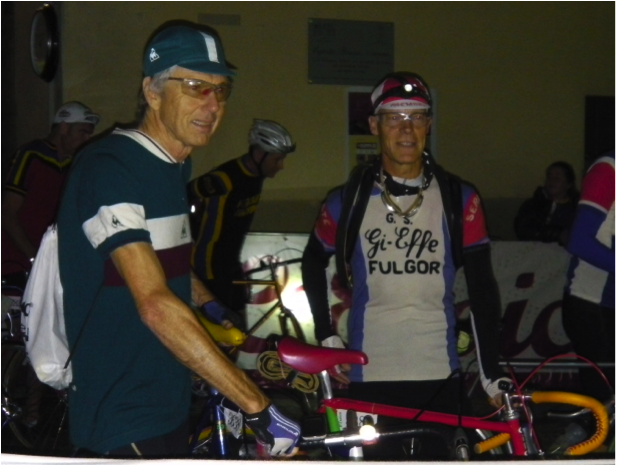 "As Hugh Tyler and I queued up at 5am in the crowded but still sleepy town of Gaiole in Chianti for the start of the 2013 edition of L’eroica it seemed as much the culmination of a journey as much as a beginning. It had been on a club ride, almost a year before, that Hugh and I had discussed the idea of riding L’eroica. L’eroica or ‘The Hero’ is not so much a sportive as an experience; a brutally hard cycle ride on vintage bikes wearing vintage kit on largely vintage Tuscan roads. 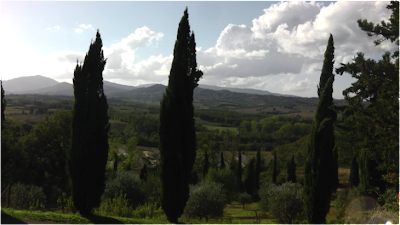 It is a unique mixture of theatre, history and superb Tuscan food washed down with Chianti and Grappa, all set in the most beautiful landscape; sort of ‘Opera on a bike’. Started as recently as 1997 L’eroica aimed to draw attention to the importance of the region’s crushed white limestone roads – the Strade Bianche. Such has been its success that the roads are now preserved and the route is permanently signposted and the hundreds of miles of lumpy, pot-holed lanes are still there (here the similarity with England ends!) The Saturday is given over to an all day celebration of the golden age of cycling with the whole town turned into a huge cyclojumble where it is possible to buy anything from complete bikes to leather goggles. The Sunday is given over to the 4 rides; 38km;75km;135km and 205km. The legendary Felice Gimondi (Tour de France, Giro, Vuelta, Milan San Remo, World Champ) even turned up to ride. Even the cars were vintage. Over the last year Hugh and I had restored our vintage steel bikes and I had learnt to nail metal cleats onto my Detto Pietro leather shoes as well as mastering the gluing on and changing of tubular tyres. Heavy woollen shirts and uncomfortable woollen shorts (lined with paper thin chamois) and the substitution of modern crash hats with cotton caps and goggles completed the madness. At a dinner on the Friday night, organised by Marco Mori (from Gusto Cycling), Marco had asked who would be riding the 205km route. Out of 70 guests that had booked their tickets through him about 8 of us nervously raised our hands – to the applause and laughter of the other diners. I had a distinct feeling that they knew something that we didn‘t…. Hugh and I met up at 4.45am. Dressed in our woollen outfits and cotton caps we felt very much in keeping. My spare tubular tyres were looped over my shoulders. In a small bag I carried an assortment of small tools (as you had to be self sufficient in case of breakdown), tubes of tub glue and a copy of the Cyclist’s prayer (taken from the Chapel of the Madonna del Ghisallo Church). As we would be riding in the dark for the first hour and a half we had lights on our bikes. The first 30 km or so was very easy going on perfectly smooth tarmac. With no warning we hit the first of the many sections of Strade Bianche; a heavily rutted sandy climb. The silence of the tarmac gave way to a crunching of gravel and gears as riders fumbled in the dark with ancient down shifters….no indexing here. I’d read about this first climb on the internet and more importantly its treacherous descent in the dark but was surprised how quickly we were down it without incident. From then on sections of Strade Bianche alternated with tarmac, the quality of the Strade Bianche varying from hard packed to an energy sapping loose gravel and sand mix strewn with stones. The feed stations were like nothing we’d experienced before…no gels or power drinks here but proper food; bruschetta; dried and fresh fruit, cakes and earthen-ware bowls of hot Ribollita, a thick rich broth of cabbage, herbs, beans and vegetables – and a choice of Chianti or Grappa – even water if you looked hard enough. I saw at least one person down what they thought was a cup of water only to discover that it was Grappa. They say that you should frighten yourself once a day…. I had a week’s worth that day. Descending at speed in the dawning light the perfect tarmac suddenly became gravel. I could not brake and could only steer by gritting my teeth more one side than the other. Hugh on the other hand seemed alarmingly happy descending at great speed on the unforgiving surface. Often on the gravel descents there would be ‘wash boarding‘, a series of hard pronounced ridges that were impossible to avoid (certainly at speed). It made me realise how extraordinarily strong the bicycle actually is as well as how well my dentist had filled my teeth. Beautiful Tuscan landscape with Chianti hills awaiting us in the distance Over the next few hours I discovered slowly how to ride on gravel; how to not try to bully the bike but to relax on it,; to allow the tyres to cut through the naturally best route and how to steer ever so gently with the knees (a bit like skiing). The hills were tough, occasionally brutally hard. The longest white dirt road climb was about 10km long and averaged 15%. Hugh was feeling strong; I was feeling ravenously hungry so we agreed to ride on independently. We were so lucky with the weather. The day before it had rained hard all day but overnight the rain had soaked through the limestone roads so that there was little mud and none of the dust normally associated with the Strade Bianche. By lunchtime it was pleasantly warm or at least in my thick woollen itchy jersey it seemed to be. At the next food stop I was approached by one of the helpers and asked if I would spare the time to be photographed for advertising L’eroica in the International press. Vanity immediately took over any need to ride a good time and I was duly ushered off to an outdoor studio. ‘Perfecto – you look like a Hero’, the photographer announced. Before my heart could swell with pride she continued… ‘.because you are so dirty’. As she took the photographs she asked my height, my weight…and my frame size! (I kid you not). Whether it was due to tiredness or mulling over the photographers questions I set off again – the wrong way – to be quickly redirected by a large group of highly amused Italian spectators. At the Friday night Welcome dinner Marco had suggested that we would be very unlikely to get round the ride without punctures or mechanical problems. With only 55km to ride I started to gloat over how wrong he had been. Almost immediately I started having trouble changing gear and my rear derailleur started making a rattling noise then the chain went completely slack and my pedals span. Somehow on a particularly rough section of road I had managed to bend the derailleur and one of the jockey wheels had completely broken out. I searched frantically for the jockey wheel in case I could repair it but to no avail. I’ve always agreed with Lord Tennyson who said, ‘More things are wrought by prayer than this world dreams of’, and so perhaps also in the spirit of Gino Bartali (who would often make his fellow cyclists attend Mass before a ride) I prayed – ‘Holy Mother of God..’ (OK I’m an Anglican but I was metaphorically in Rome) ‘…please help me mend my chain’. I found my chain splitter and spare chain link so I cut the chain short and turned my 7 speed into a single speed. I selected a climbing cog because I was determined not to have to walk any of the remaining climbs. My prayer was answered with that reassuring crack of the spare link locking. With a lifted spirit I cycled on, my legs spinning madly. The last climbs were indescribably hard with my single gear and I’m not sure which burnt the most; my thighs or my arms wrenching on the handlebars. By the end of the ride I would hold in the highest esteem those brave few who had ridden the whole ride on single gear bikes. Hugh, some distance ahead of me by now, had had a trouble free super fast ride and finished in the first wave of 205km riders. 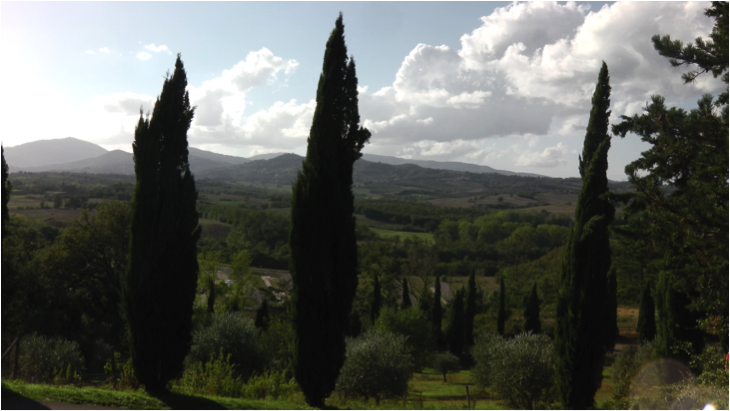 I limped in some time later absolutely drained but full of good spirit, Ribollita and perhaps a little Chianti and absolutely delighted that I’d made it round and had not had to resort to putting a foot down on any of the climbs. It was undoubtedly the hardest day I’d ever spent on a bike. I thought La Marmotte was pretty tough but this was in another league…. My hands were raw and my arm muscles ached but Hugh and I both agreed that it had been an absolutely brilliant day. As I sat in the nearest bar to the finish line a hugely moustached Italian gent next to me laughed at my repaired bike and showed me that he had sheared off his pedal in the last 35km and had to ride one legged. Now that’s what I call a bloody Hero!" More photos and original article here. 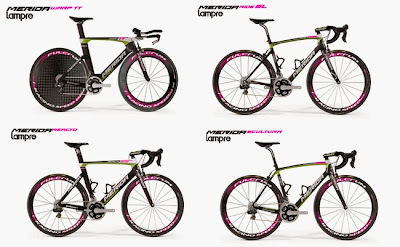 The Team-Lampre service corse in Usmate Velate (Milano) has been broken into and robbed of all bicycles, accessories and and material between the night of Saturday 23 November and Monday 25 November. Selle San Marco saddles all from 2013 season and all Prologo saddles all for 2014 season. Power meter systems: SRM power meters from 2013 season and Rotor power meter crank system with Garmin computer for the 2014 season. In the first hours of Monday morning the Monza and Arcore police were present to do all the necessary steps that need to be done in these circumstances and are working on a hopeful recovery of material. 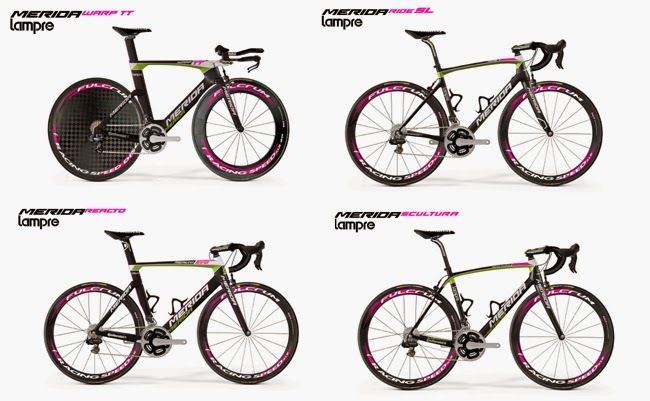 This is a huge loss for team Lampre-Merida, as the bicycles were all ready for distribution to the various riders in there first training camp of December, thus creating logistics problems for future consignment of the bicycles for the 2014 season. All the material is easily identified as it is all personalized for team use and thus the team is hopeful of recovering as much material as possible. Team LAMPRE-MERIDA welcomes any possible information with regards to the theft and a reward will be offered in return, please contact via e-mail or phone by contacting team@teamlampremerida.com or the teams mechanics at +39 335-6217725. The photo contains the following bicycles Merida TT Warp, Merida Reacto Evo, Merida Scultura and Merida Ride. 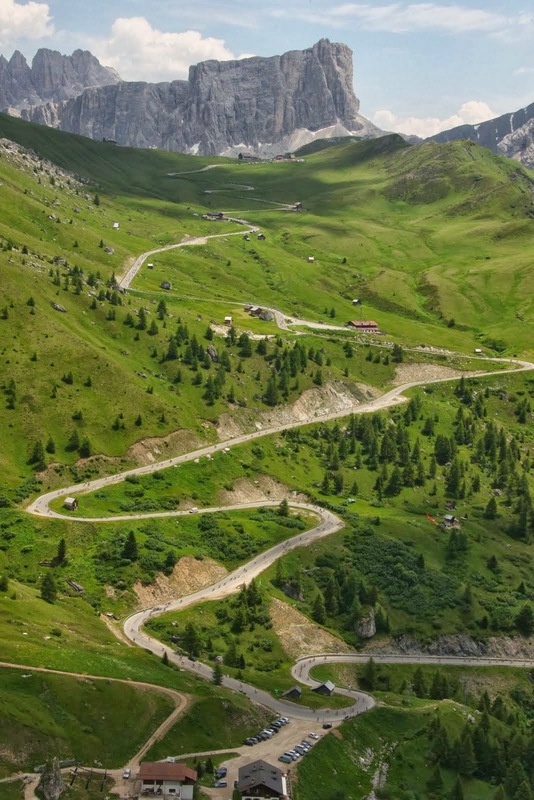 The draw, from 32,000 registrations, for the starting places at the 28th edition of the Maratona dles Dolomites-Enel took place in front of a notary. Click here to find the participants list! - Charity registrations November 26th 2013 as from 6 p.m. (GMT+1)!! Gran Fondo Super Prestige calendar launches in 2014 with eight listed events and offers a new challenge for cyclists. 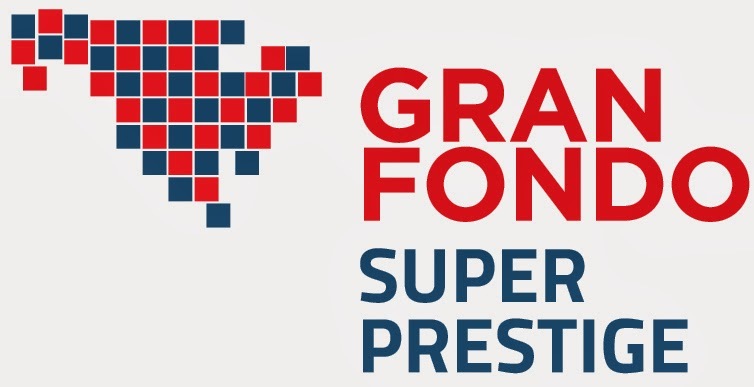 New for 2014, Gran Fondo Super Prestige (GFSP) is a challenge established by GFNY Magazine that includes the premier and truly competitive long distance cycling events in North America. Riders have to complete the longest distance course at three out of the eight events to obtain Gran Fondo Super Prestige Finisher status for 2014. Women can complete the longest or the second-longest course at a Gran Fondo Super Prestige event to qualify for Gran Fondo Super Prestige Finisher status. GFSP is an independent entity that does not create any affiliation among the events. 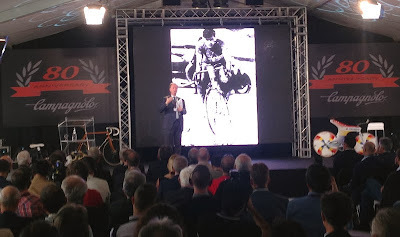 "With Gran Fondo Super Prestige, we're emulating the highly successful Prestigio series of our Italian sister magazine Bicisport" says GFNY Magazine publisher Uli Fluhme. "I've followed the series since its inception in the 1990s and have participated in many Prestigio Gran Fondos. What I love about Prestigio is that it's not about winning a race which only a few riders will ever have a shot at. Instead, it's about completing some of the toughest Gran Fondos out there. That in itself provides a challenge not to be underestimated and keeps riders motivated to train all year." A Gran Fondo is a marathon for cyclists. It’s an event where riders get a chance to take on a cycling challenge, like runners and triathletes have done for decades over long distances, without stopping at stop signs or traffic lights while having a chance to do their best. Events in the Gran Fondo Super Prestige calendar are following the concept of a true Gran Fondo and its three key elements: police giving cyclists the right of way at every intersection, individual chip timing and rankings based on time and a tough course. In addition, all events listed on the GFSP calendar meet a size requirement to be considered "Super Prestige." The achievement of Gran Fondo Super Prestige Finishers will be recognized with a GFSP badge and sticker as well as lifetime bragging rights. Riders will be recognized in the GFNY Magazine. Every cyclists who finishes an event on the GFSP 2014 calendar is automatically part of GFSP and is in the running to be a Gran Fondo Super Prestige 2014 Finisher. Gran Fondo Super Prestige 2014 calendar (in order of date): Campagnolo Gran Fondo New York, Gran Fondo Axel Merckx, RBC Gran Fondo Banff, RBC Gran Fondo Whistler, Gran Fondo Niagara Falls, GFNY Italia, Gran Fondo Hincapie. As he notes, "I would greatly appreciate any assistance you the reader can offer in updating this timeline as this is the only way the accuracy of this timeline can be improved. Chuck Schmidt ". Chuck also has a Cinelli Timeline. Colnago Master X-Light Art Decor, "Aged to Perfection"
Read the review of the 30th anniversary Colnago Master X-Light Art Décor here on www.cyclingnews.com. 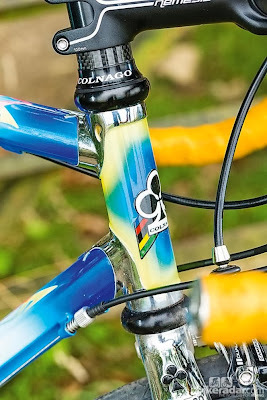 Some quotes: "aged to perfection", "super aggressive", "beautifully styled", "famous Art Décor paintwork", "a bike everyone should experience". Shiny alloy parts would be nicer, yes? This afternoon in Dublin, Ireland, Italian Prime Minister, Enrico Letta, gave an official Giro d'Italia Maglia Rosa jersey to the Republic of Ireland Prime Minister Enda Kenny as a gift. 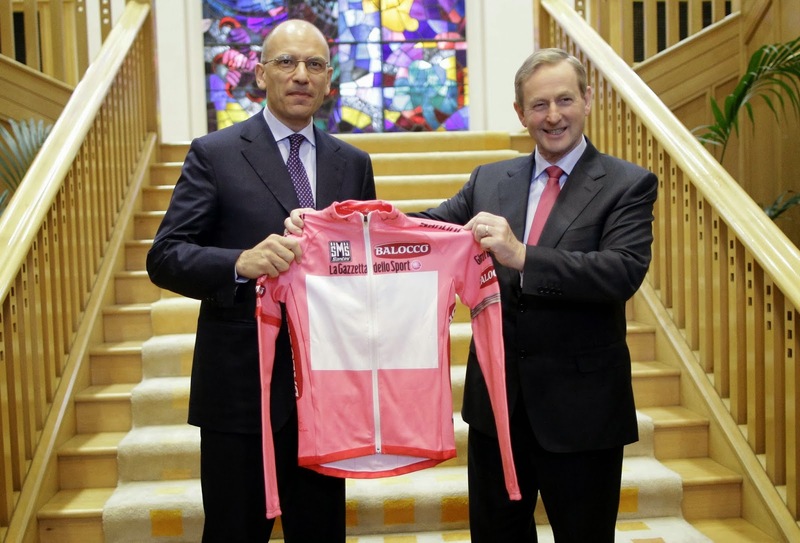 After the official press conference that followed the meeting between the two Prime Ministers, symbolizing the friendship between the two countries and honoring the Grande Partenza of the Giro d'Italia, 2014 that takes place on 9 May in Belfast, with the third and final Irish stage of event taking place on 12 May in Dublin, the symbol of the leader of the Corsa Rosa was presented. The group of people officially representing the Giro d’Italia at the event included Andrea Monti, Editor of La Gazzetta dello Sport; Mauro Vegni, Giro d'Italia Director of Operations; Carlo Rossanigo, RCS MediaGroup Communication Director; Francesco Moser, the Italian cycling legend; and Darach McQuaid, member of the Irish Organizing Committee. It all began 80 years ago during a difficult race in freezing conditions with less than ideal equipment. At the base of a climb, hands frozen and nearly numb from the bitter cold, Tullio Campagnolo struggled to remove his rear wheel, cutting his hand in the process. In this very moment, having lost a race due to mechanical inefficiencies, Campagnolo decided that he would take it upon himself to find a better solution. Upon returning home he set about to design the world’s very first quick release mechanism in the back of his father’s tool store. 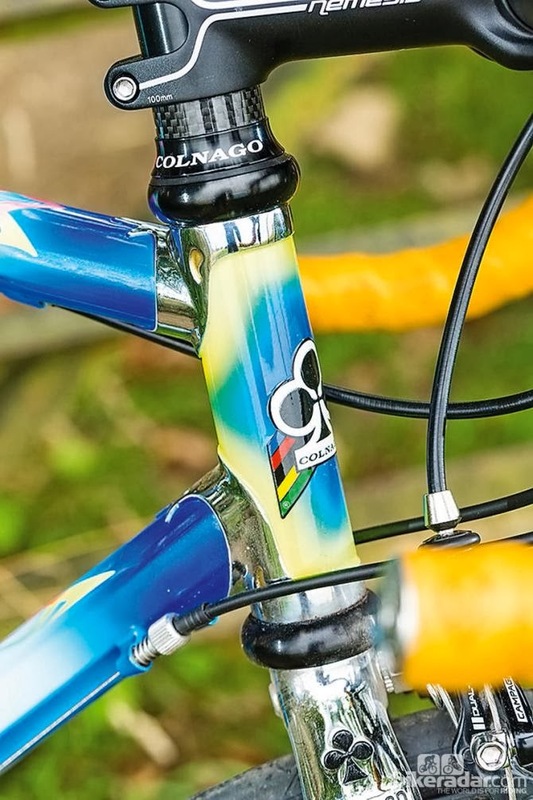 While it needed only to be functional, Campagnolo produced an elegant prototype, as beautiful as it was revolutionary. This all took place in 1933 but this very same process has been played out time and time again during the long 80 year history of the company. 2) Continuously innovate to find unique and functional solutions. 3) Don’t settle for mere functionality, but make it elegant. This process was established that very day in 1933 by Tullio Campagnolo but replicated hundreds and hundreds of times through the years and has become the day. Driven by the same passion for cycling that saw Tullio ride countless kilometers in grueling conditions, Campagnolo has always dedicated itself whole-heartedly into improving the cycling experience from past to present. Passion for cycling pushed the company to work closely with the sports best athletes to not only improve their performance but also to improve cycling for the amateur. Passion for the bicycle as a whole pushed the company to collaborate with the world’s best frame producers to find elegant and functional solutions as well. These collaborations stem back over 80 years and continue to this very day. whom we have shared and continue to share this most fantastic of journeys can take part in the festivities along with us. A celebration was held at the company headquarters during the Giro d’Italia’s arrival to Vicenza (May 22nd) where a great deal of the Campagnolo “family” were present. Regrettably there isn’t a tent large enough to hold all of the cycling enthusiasts and amateurs who have also shared this long and fantastic history with us. However, we hope that anyone and everyone who has ridden or rides with Campagnolo will celebrate this important milestone with us. Although everyone couldn’t be with us physically to enjoy the celebration in person, we hope that you will all enjoy a brief video of the day’s events. Enjoy the video and please share, post and tweet this video link to all who you feel will appreciate it. Have you already pre-registered for the 28th edition of the Maratona? If not, hurry up: the pre-registrations close at midnight of November 6th 2013 (GMT +1). For the pre-registration use the following link! 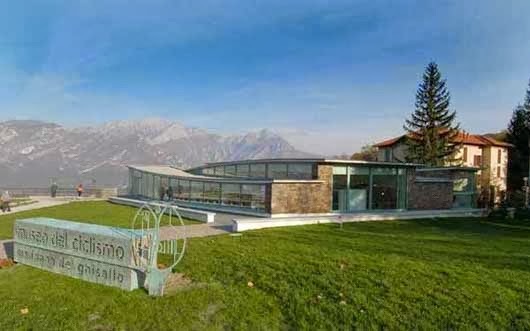 The Italian economic crisis arrives at the Museo del Ciclismo, one of the best cycling museums in Italy. After this weekend the museum will remain closed until April. 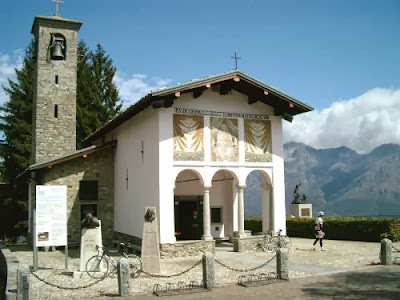 The Madonna del Ghisallo chapel will remain open.